Born from the efforts of Indiana University South Bend students and professors, the Civil Rights Heritage Center transformed a once-segregated city swimming pool into an active learning center. It explores the civil rights struggles of the past so people can take action in the present and build a better future. See what’s coming up next at the Center. See, hear, and learn more about South Bend’s history online and in person. If you’re a current IU South Bend student, learn how the CRHC can support you. Learn more the history and mission of the IU South Bend Civil Rights Heritage Center. Visitas guiadas en español disponibles sin cita. For groups of ten or more, we will gladly offer free English or Spanish language tours by appointment during or outside of our regular open hours. Tours share the story of the Engman Public Natatorium and the history of segregation against communities of color in South Bend. We will gladly work with your group to identify age appropriate activities to add to the experience. To find out more, contact George Garner, CRHC Curator, at gwgarner@iusb.edu. In 1922, South Bend opened its first public swimming pool. Over the front door, its name was carved into the concrete: Engman Public Natatorium. Harry Engman was an executive with the South Bend Malleable Steel Range Company. Engman was able to get his name carved into the building because he donated the land upon which is was built. We do not know how much he knew about the use of the word public in the pool's title. However, in spite of that word being there, the people who ran this city owned pool banned African Americans from using it. That act rejected people of color as being part of the public the pool claimed to allow in. A group of local African American leaders led actions to change it. They were lawyers and politicians who worked within the legal and political systems to try and make change. In 1936, these leaders filed a protest with the state. The state agreed that African Americans deserved access to this taxpayer funded pool. They did not agree that blacks and whites should swim together. As a result, in 1936, the pool opened to people of color only one day a week. In 1950, after rejecting people for almost thirty years, a legal motion to fully open the pool finally passed. Twenty-eight years later, in 1978, the pool was no longer the largest in the state. It was no longer the newest. The pool needed costly repairs. Now in a mostly minority neighborhood, rather than fix it, the city chose to close it. After sitting vacant for another thirty years, a group of local residents and agencies worked with Indiana University South Bend to breathe life into the crumbling building. In 2010, they rebuilt it as the new home of the IU South Bend Civil Rights Heritage Center. Today, we use its story to share past and present issues of civil rights and social justice. We encourage you to learn more about the history of racial injustice, the continuing fight for civil rights, and the issues people continue to face. 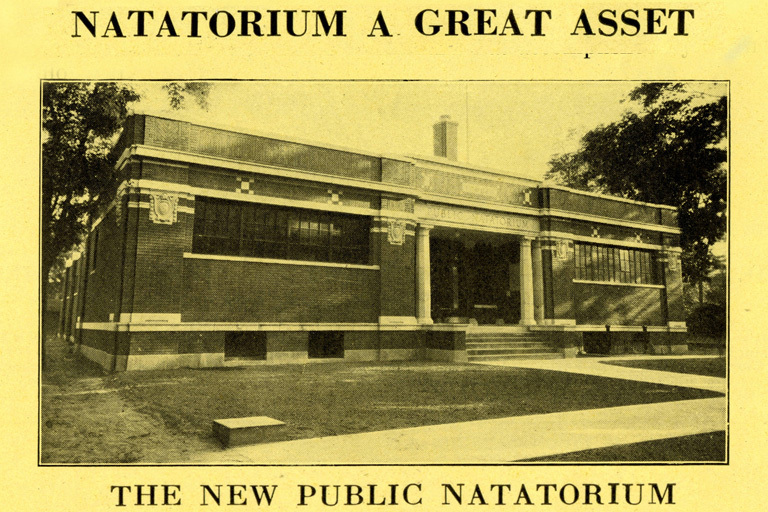 Visit us for a tour to learn even more about the history of the Natatorium. Come to an event. Check out a book from our library, or view any of the thousands of local history documents, photographs, and oral histories we have available.